The guys over at F1 Podcast have gotten their hands on a world exclusive extended version of the second F1 2010 development diary video that was released five days ago. Compared to the original 2:30 minute video, this one is almost six minutes long, featuring much more in-game footage and physics discussion with the Codemasters staff. Following their maiden Formula One title that was released only for the Playstation Portable and the Nintendo Wii, Codemasters will be bringing the 2010 Formula One season to the PC, the Xbox 360 and the Playstation 3. 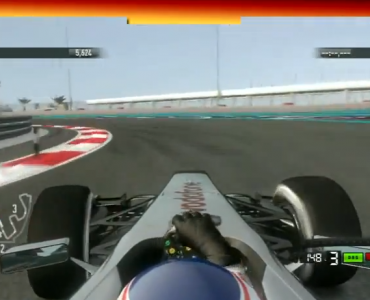 F1 2010 has been confirmed to be released in September 2010. Your not meant to embed the video just post a link for exclusive videos. I don’t think F1 Podcast frowns upon embedding that video, they could have disabled that on Youtube with just one click. Well, the most impressive thing about that was the new shots of teh tyre modelling. It’ looked great! Although the post processing seems strange, sometimes it’s very strong, at other points not. Mr. A: I’m not quite sure I understand them correctly. When they talk about keeping driving psychics authentic but at the same time easy to play, are they talking about with or without driving aids activated? And are they talking about driving aids that will be selectable in the game or always on? I believe they say that with all of the Aids off the gameplay is much more like a simulation and then when you go about adding each aid it becomes more accessible but still fun (the confusing part). If you have ever played rFactor F1 mod or some of the older EA F1 games the Aids make the car much more automated such as sticking to the racing line or braking for you. If you remove all of the aids it becomes 10x harder to drive the car. I’m guessing they will follow this route as it’s successful in both arcade and simulation markets and as mentioned in the video its easier to make a simulator accessible to the casual market rather than making an arcade game feel like a simulator. The only simulation style components that may be missing is things like the parade lap along with a more casual show voting movie-style aesthetic. Can weather change during the race? Can I adjust at least brake balance while driving? Can I decide when to make a pit stop and what tyres to choose? Can I drive with my own name in career name? Montoya: I don’t think F1 Podcast frowns upon embedding that video, they could have disabled that on Youtube with just one click. This preview http://www.computerandvideogames.com/article.php?id=241755 seems to point toward a sim based experience with aids turned off.